Social media has been abuzz with news that a sassy card game just for equestrians is on its way. We spoke with Equestrians Against Normalcy’s creator Victoria Morrow to learn more! All photos courtesy of Equestrians Against Normalcy. First there was Apples to Apples. The premise of the game is simple: a group card game, everyone holds a hand of “thing” cards — objects, concepts, proper nouns, etc. The active player in each round draws a “description” card — say, “delicate” or “furry” — and players play the “thing” card in their hand that they feel best (or most hilariously) matches the description. The active player chooses their favorite, and the player who played the winning selection gets a point. This was THE game for many years at gathering and parties. Then there was Cards Against Humanity: the party game for horrible people. Same concept, but with a much darker, more cynical, twisted and sometimes downright cringe-y feel. 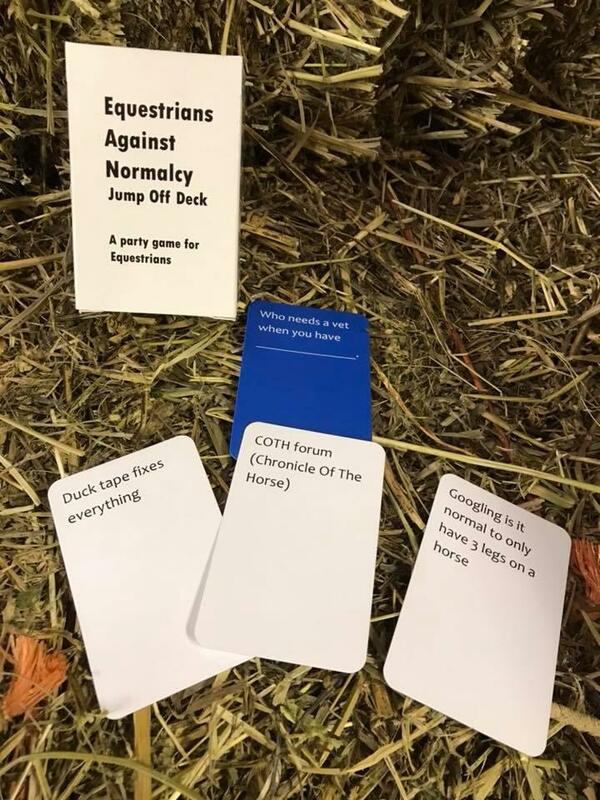 I was coaching a college riding team when CAH first became popular, so needless to say the now-iconic black and white decks made an appearance at basically every away horse show or long-distance competition. Cards Against Humanity launched a hundred spoofs, including a couple of much-loved iterations right here on Horse Nation: check out our first collection and our second collection. 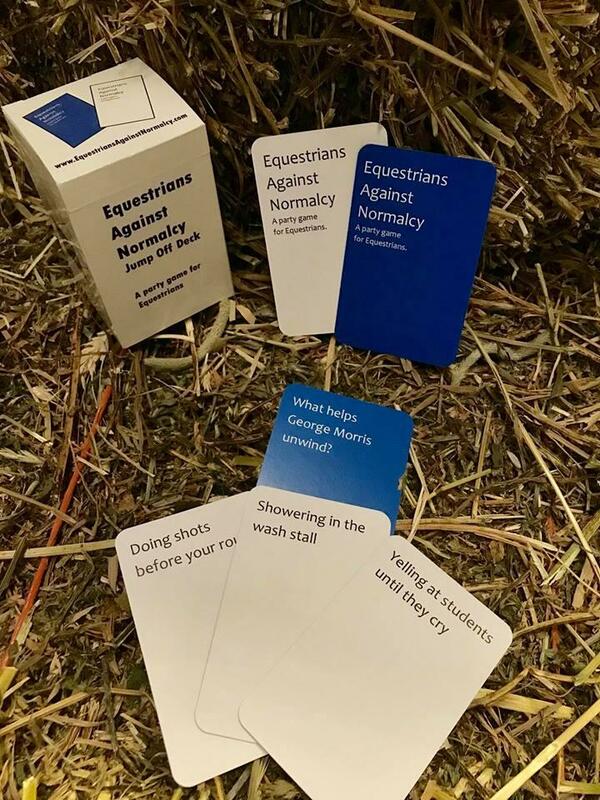 Now, horse-loving ladies and gentlemen, the time has come: introducing Equestrians Against Normalcy, a card game created by an equestrian for equestrians. Viral posts have been circulating early this week featuring Equestrians Against Normalcy, which is in the final stages of development with hopes to be available on the market just in time for the holiday season. We caught up with game creator Victoria Morrow, a full-time professional horsewoman, to learn more about the game. She’s exactly the kind of sharp, witty individual that you’d expect to find at the helm of a game celebrating the weirder things about horse life — she walks the walk of the equestrian world, finding time to sit down and answer our questions between teaching lessons and thawing frozen water buckets. In short, she’s our kind of girl. HN: Naturally, we have to ask: how did you come up with the idea for Equestrians Against Normalcy? VM: Playing card games and board games with regular friends and horse friends has always been a pastime for me — especially when we have been gone to longer horse shows. One of the easiest games to travel with have been card games where you play one card to go with another; over the years quite a few have come and gone. Two of the more popular ones right now are Apples to Apples and Cards Against Humanity. It was the mechanics of those games that made me think it would be a blast if there was one that was geared towards horse people, and adult horse people especially. There are some horse-themed games out there, but they are all geared towards kids. This all started to come about last winter while I was laid up from the latest in surgeries from a riding accident years ago. I had a lot of spare time on my hands and can’t stand to sit idle. So I decided that I wanted to make something that would be fun for adult riders to be able to play with each other. At the same time there is nothing in it that is offensive, so it is something that the teen riders could also play. HN: Who are the masterminds behind the game? Who makes up your team? VM: Team? That would be great, but it’s just me. I run a stable and offer boarding, training, and lessons. Horses have been part of my life as long as I can remember. My father grew up on the race track riding horses for his father who was a flat race trainer and was a steeplechase jockey. He started me riding and showing when I was three and later got me into eventing which lead to me being able to compete in the US and Canada and eventually start my own business. I have been very fortunate to have him there for me. My husband Steve has been kind enough to get the website up and running, and the email working. Luckily he is good with computers as the only thing I use them for is shopping for horses and tack! HN: There’s certainly a parallel between this game and Cards Against Humanity — did you need to do any special licensing to imitate the original? VM: I love playing CAH with my friends. And while Equestrians Against Normalcy and CAH have the same game play mechanics of using one card to finish another as do many others, that is pretty much it. EAN was designed specifically for the adult equestrian. 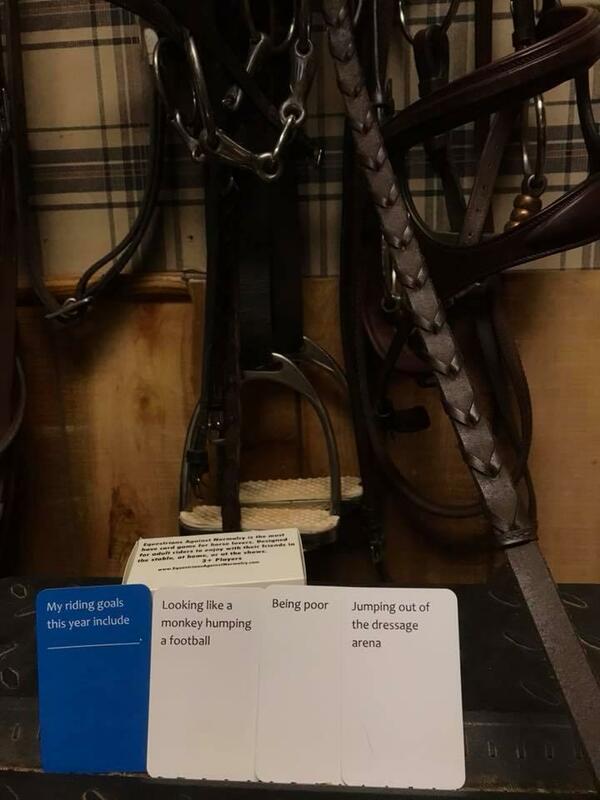 All of the cards are equestrian themed and can be safely played in public so that you can play at the shows and stables — trainers can play with their clients.I love CAH but definitely would not play it with my clients or at shows. Game mechanics are not something that you need special licensing to use — in fact it is one of the things that anyone can use, which is why there are so many games out there using the same ones. EAN definitely is its own stand alone game and we wouldn’t want anyone to confuse it with any other games. We tried to make sure our packaging was not the same as others down to the font. HN: What is the process like for developing and producing a game? VM: A lot of work! I couldn’t even tell you the hours that went into just what went on each card. Coming up with unique things for over 500 cards was more work than you would think! I did have to beg the assistance of a friend of my husband’s for the help type setting the cards. It turns out no matter how much you yell at the computer and computer program it doesn’t help. I also now have a new appreciation of graphic designers and their ability to use Illustrator. It took awhile but I did manage to design the boxes and get the prototypes made. But before we even had the prototype cards made up we made a basic one at home to play with different horse groups to see if it was as much fun as we hoped it would be, and it was. After the prototypes were printed, that was when we started to send them out to other people to play. Since this is a side business that we are doing, it is taking longer to get to production for sale than it would have if I wasn’t trying to do it between working horses, teaching and running a stable. HN: There aren’t a lot of games that exist specifically for “horse people” — there are games for horse-loving kids, but I can’t think of any equestrian-specific games off the top of my head. What are your thoughts on this niche market? VM: I think people definitely have a desire to have a game geared towards the adult rider. Especially after seeing the reaction to our Facebook page! There are so many things out there geared towards riders and their horses, but not things for them to have fun together with. We spend so much money on making sure our horses are happy and have fun in their stalls and paddocks. It is about time we got something too. HN: What’s next? Where will people be able to purchase a copy? VM: The biggest thing is getting EAN ready for sale to the public. We are trying really hard to have EAN available for purchase online at the very start of December so that people can have it for the holidays. 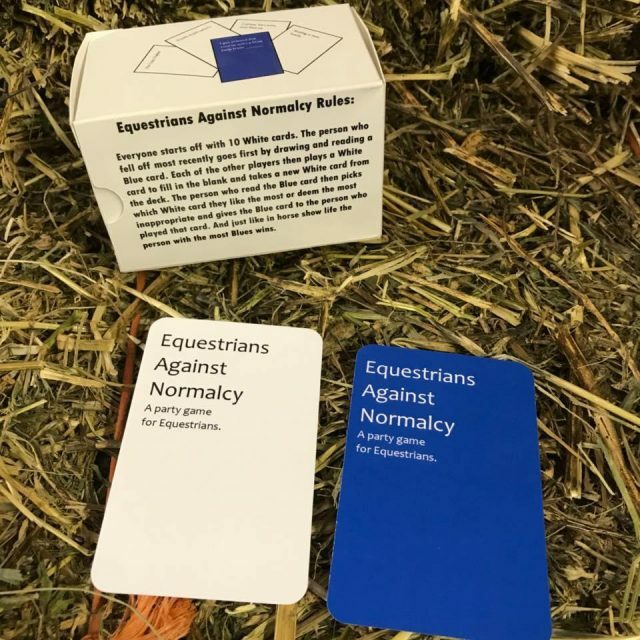 As soon as it is available we will be posting links to the online purchasing area on our Facebook page Equestrians Against Normalcy and on our website http://equestriansagainstnormalcy.com. Since it is such a small company — just me with the assistance of my husband — we’re partnering with a company that specializes in card games. Since the decks will be printed on demand, there’s no fear they’ll run out. And their turnaround time for producing and shipping has been fantastic. Plus they ship worldwide so anyone can order! If the game does well we would love to be able to provide tack stores with them as they have inquired about the game, and to develop different decks for different riding disciplines and breeds. We definitely will keep everyone posted via the Facebook page and website about the game’s availability! Update 11/24: Equestrians Against Normalcy is now available! Check out https://www.thegamecrafter.com/designers/equestrians-against-normalcy to order. We’ll have a sneak peek and game review of Equestrians Against Normalcy coming soon! Keep it locked on Horse Nation and the EAN Facebook page/website for updates about the game. Go riding!